​Are you watching your son(s) scroll through life, with their earphones, rapid-fire thumbs and six-second attention spans? 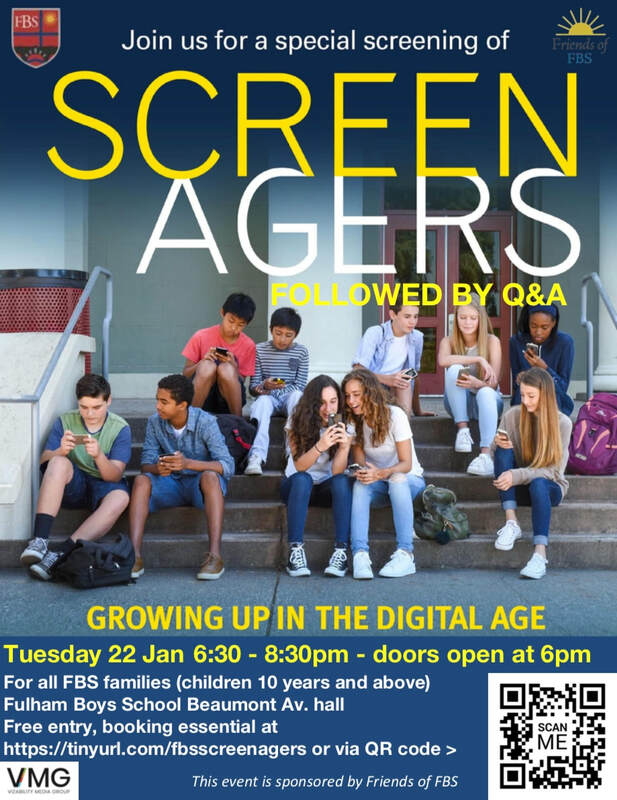 On Tuesday 22nd January at 6.30pm in the Beaumont Avenue Sports Hall, Friends of FBS are hosting the screening of the Screenagers film, which will be followed by a short panel Q&A. ​this event is FREE for all FBS families to attend*. Friends welcome a £5 optional donation per adult. Click the arrows to adjust to the number of adults attending. *The film is rated 10+ and siblings of FBS students are invited. Doctor and filmmaker Delaney Ruston wondered about the impact of "too much" screentime, and about the friction at home and with school as parents tried to limit it. ​SCREENAGERS explore the struggles over social media, video games, school work and internet addiction. Through poignant, and unexpectedly funny stories, along with surprising insights from authors, psychologists and brain scientists, SCREENAGERS reveals how tech time impacts children’s development and offers solutions on how adults can empower them to best navigate the digital world and find balance.